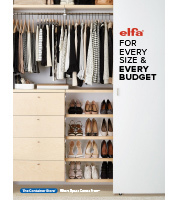 Enjoy loads of style when you install our exclusive White Elfa Laundry solution in your laundry room. Available only at The Container Store, it features Ventilated Shelves and Hanging Drawers to store detergent, other laundry essentials and folded items. A Closet Rod hangs drip-dry garments or keeps freshly pressed garments neat. All Elfa components are adjustable, so the solution is completely flexible! This solution is designed to fit a space at least 4' wide . If this doesn't describe your space, please contact us so we can design the perfect solution for you with our free service! Do you think you can add the foldable dry rack to this system? Could it replace a shelf or go under the clothes rod? I was thinking of putting the foldable dry rack under the clothes rod (about halfway down) and then use one or the other. The Fold-Away Drying Rack (item # 10036207) could not be attached to elfa components, and it is too wide (28&quot;) to fit between the hang standards in this configuration. However, we can create custom elfa designs to fit your space and needs. Please give us a call at 1-800-733-3532 for more details. Can this elfa system be installed on a concrete basement wall? We do carry elfa concrete &amp; masonry screws that would work for basement walls.